Backing up VMs is a resource-intensive process, which places an extra load on your infrastructure, be it VMware, Hyper-V, or AWS. This is particularly noticeable, when it comes to large environments with thousands of VMs. Too many backup jobs running concurrently on the same host, or on the same network may affect the performance of your virtual environment and slow down your VMs. To reduce the load on your resources, you need to carefully schedule and structure your backup jobs, to ensure the shortest backup windows possible. Scheduling data protection jobs may be tricky in large virtual environments, where you need to fit multiple jobs into a backup window and avoid possible overlaps. 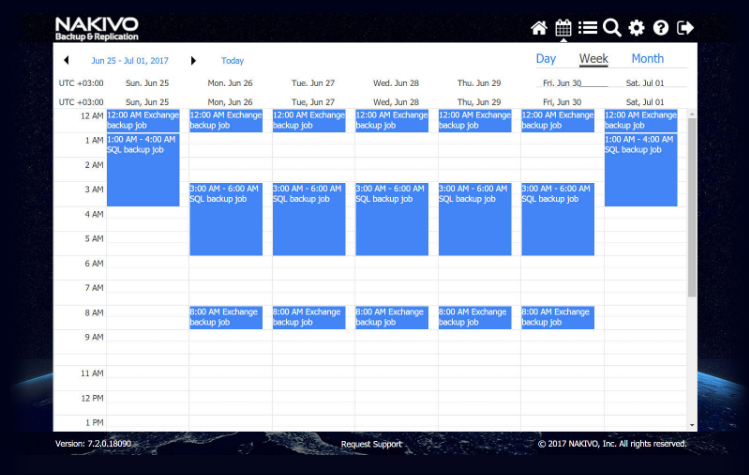 To resolve this issue, NAKIVO Backup & Replication features the Calendar dashboard, which is aimed to greatly improve job scheduling. The Calendar dashboard in NAKIVO Backup & Replication is really easy to use, scheduling backup jobs has never been easier! Get the free trial and try it yourself!